What’s So Special About The Summicron M 35mm? The art of designing optical systems fascinates me. Lens designers are still using the same centuries-old methods and concepts even though today’s photographic lens design is no longer a simple meniscus lens. This entry will discuss the most desirable Leica lens, the symmetrical, eight element Summicron 35mm f/2. But first, I’d like to introduce you to a brief history of photographic lens design. The quest for better photographic lenses began because single element lenses suffered severe longitudinal chromatic aberration, making them difficult to focus. In 1817, Carl Gauss published an article with reference to the complete removal of chromatic dispersion, which gave birth to the Gauss lens. By 1895, Paul Rudolf—of Carl Zeiss Jena—refined the Double Gauss design of Alvan Clark and Bauch and Lomb in the original six element symmetric f/4.5 Double Gauss lenses. Sometime in 1949, Ernst Leitz III decided to set up a special optics research lab just for the purpose of finding ways to produce the highest quality, non-radioactive photographic glasses. Historians and photographic experts also believed that Leitz’s optics research lab discovered non-radioactive photographic glasses, such as the lanthanum, used to design the elements of the famous Summicron 50mm in 1950 and later in the one-of-a-kind Noxtilux f/1.2. In 1958, Leica introduced the legendary symmetrical Double Gauss, single coated, ten blade aperture, eight elements Leitz Summicron 35mm f/2 type I, designed by Dr. Walter Mandler. This symmetrical eight element lens was known for its compact size, sharpness, large aperture and almost free of distortion. It’s also one of the first photographic lenses that used thorium-free rare earth glasses. The Summicron 35mm f/2 type I had three versions. One was made for LTM bodies. About 12,000 were made for the M2 bodies—which would work on any M body, and 10,000 were made for the M3 bodies. The M3 version came with the goggle since the M3’s viewfinder didn’t cover the 35mm focal length. The price for the M2 and M3 versions ranged between 1,000 to 12,000 USD, depending on the condition, black or chrome. The 1958 Summicron 35mm f/2 type I was originally designed and made in Canada but the later batches were made in both Midland, Canada and Wetzlar, Germany. While some users believed that the Wetzlar lenses were better built, others thought that the Canada version was the best. The type I was the only model that had eight element optics. The 1969 type II and the 1971 type III were built with six elements. The type IV, black “Bokeh King” made in 1979, had seven elements, with a convex focus tab version and a concave tab version. There was no chrome version until 1994. The ASPH, type V, model was introduced in 1996, also had seven elements. No matter if it was the classic type I or the “Bokeh King”, this Leica legacy Summicron 35mm line had captured many iconic photos by legendary photographers like Helmut Newton, Marry Ellen Mark, Diane Arbus and Ernst Haas. According to C. D., a Leica historian and collector, the 1958 Summicron 35mm f/2 type I wasn’t a perfect lens but its imperfections were so minimal human eyes could not detect any. Like other collectors, C. D. agreed that this particular model were just as good as any apochromatic (APO) lens on the market today. The two lanthanum elements that faced the aperture diaphragm—high-index low-dispersion optics—were to correct the chromatic aberration; while the symmetry of the Double Gauss design further helped to reduce other types of optical aberrations. Inexperienced Leica users often thought that the aspherical element in the later versions would produce more contrast. In fact, it had nothing to do with the contrast of a lens. The purpose of the aspherical element was to maintain a higher level of sharpness toward the edges of the frame, also to reduce the chromatic aberration when the aperture was at its widest aperture. The lack of contrast resulted from different circumstances. It could be from either shooting against a strong light source, having the aperture at its widest or the type of coating on the lens. The Summicron 35mm f/2 type I was a single layer coated lens; its contrast could not be compared to the late multi layer coated ASPH model. While most single-coated lenses rendered beautiful BW photographs, they’re opposite when it came to color photographs. For this Summicron type I, the contrast improved noticeably at f/2.8; however, fine detail only improved at f/5.6 and smaller. Another beauty of this lens, which not many people paid attention to, was the brass, double helicoid system. Both the front and back helicoids were designed to be rotated independently, but they were secured through the focusing ring. 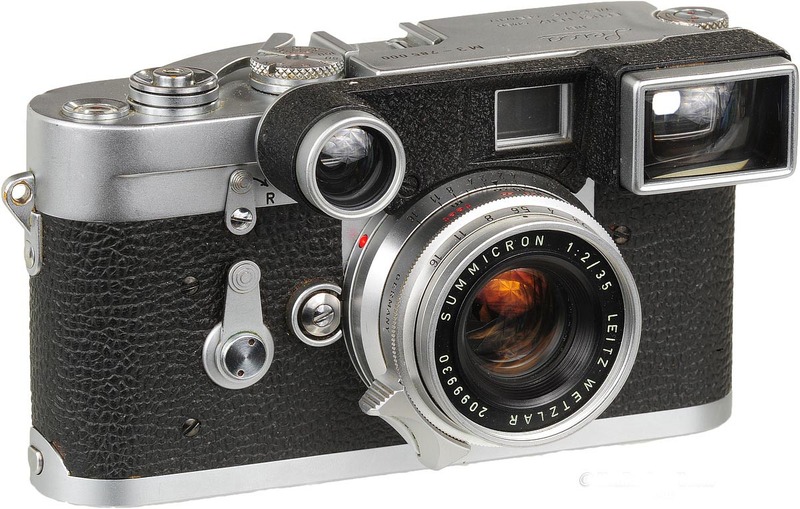 This mechanism allowed photographers to precisely adjust the front-to-back position of the rangefinder helix. This type of arrangement required a lot of hand adjustments during the assembly stage. That explained the hand filing marks we might find on the helicoids of the Leica’s classic lenses. This small but mighty 35mm focal length was a perfect lens for black and white shooters, street photographers and photojournalists. Overall, it’s about 1.4” and weight about 8.5 oz. Much heavier than you would expect from a tiny lens. Inside the brass tube was the double helicoid system, the housings for the glass elements, spacers and a 10 blade aperture diaphragm. In later versions, the aperture diaphragm only has 7 blades. By combining the lanthanum elements with the Double Gauss system, Dr. Mandler was able to design a lens with even less optical aberration than the new ASPH models. The Leitz Summicron 35mm f/2 type I was known for its center sharpness, better selective focus than the 35mm Summilux at wide aperture without the lack of pleasant bokeh. This made the Summicron 35mm f/2 type I an ideal lens for candid, portrait and urban photography. Generations to come, I am certain that this lens will continue to be the most sought after Leica 35mm lens. This entry was posted in Leica, Leica Film camera, Leitz Lenses and tagged Summicron 35 on June 22, 2014 by Leicaphila.